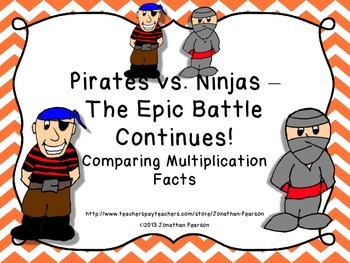 Comparing Multiplication Facts - Pirates vs. Ninjas Pt. 2! **This item is included in the Multiplication Strategies Bundle - Seven Different Activities - Over 200 Cards! The epic battle between Pirates and Ninjas continues in your math classroom! Your students will have a great time comparing multiplication products using these themed cards, one set for pirates and one set for ninjas. This activity includes two sets of cards containing the same numbers. Students will have their own sets of cards. During each round of play, the students will each turn over a card from their deck. 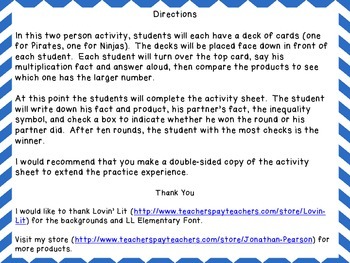 Each student will then record his multiplication fact and product and the multiplication fact and product of his partner on the included activity sheet. They will compare the products using the inequality symbols (<, >, or =) and determine a winner. Each set of cards can be printed on a cardstock and laminated to extend the life of the activity. This is sure to be a favorite, so it is recommended that you make several copies. This game is based on the best-selling product Pirates vs. Ninjas - A Comparing Numbers Game. Students familiar with that activity will love this game. It is a great way to review two skills, comparing numbers with inequality symbols and multiplication facts. 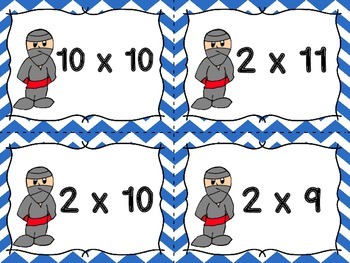 For other great multiplication activities, please visit my store. 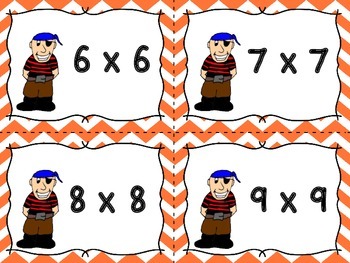 You can also follow the links below to some great multiplication activities. Multiplication Facts 1-4 - Earth! Water! Fire! Multiplication Facts 5-8 - Earth! Water! Fire! Multiplication Facts 9-12 - Earth! Water! Fire! If you purchase this product, please be sure to leave feedback. You can also Like my Facebook page for updates and special items.